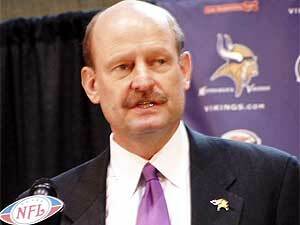 The Minnesota Vikings have hired Brad Childress to be the team's new head coach. Vikings owner Zygi Wilf announced the move Friday morning, just days after he fired coach Mike Tice. Childress is the former offensive coordinator for the Philadelphia Eagles. Childress says he's got the experience and the values needed to bring a championship to Minnesota, even though he's never been an NFL head coach before. Minneapolis, Minn. — Vikings owner Zygi Wilf wasted little time contacting Brad Childress. Childress says the Vikings called him Monday afternoon. "These guys are rather persistent," Childress said. "I'd just gotten the last player out of my office at about 1 o'clock, with the exit interviews on Monday." Within a few hours, Childress was on a plane to the Twin Cities to have dinner with Wilf and other members of the ownership group. On Tuesday, he was in a meeting with legendary former Vikings coach Bud Grant. He stayed over on Wednesday when the Wilfs asked him back for a second interview. By Friday morning, the deal was done. With seven other teams looking for head coaches, Wilf said he considered Childress the "elite coach," and wanted to get him before somebody else did. "He embodies class, character, discipline and is a great family man. Bottom line -- Brad Childress is a winner," said Wilf. Discipline, or lack of it, may have helped doom Mike Tice. Many of the Vikings losses this season were punctuated by numerous penalities, turnovers and other mistakes. And then there are the off-the-field problems. Last year, coach Tice was fined for scalping his Super Bowl tickets. Starting running back Onterrio Smith was caught with a device designed to beat drug tests and was suspended by the league for the season. Finally, there was the wild lake cruise last October that produced misdemeanor charges against four players, including quarterback Daunte Culpepper. Childress didn't address the scandals directly, but made it known that he'll run a tight ship. To be a great football team in Minnesota, our players will have great discipline within this scheme offensively, defensively and on special teams. And that discipline has to carry over off the field. "To be a great football team in Minnesota, our players will have great discipline within this scheme offensively, defensively and on special teams. And that discipline has to carry over off the field," Childress said. "The coaching staff will have high expectations for our players, and it's critical that they have those same high expectations and high character off the field." For example, last season, the Philadelphia Eagles were faced with a problem with their star wide receiver Terrell Owens. Owens had publicly trashed his quarterback, coach and teammates in the media. He even got into a locker room brawl with an ex-teammate. Eagles head coach Andy Reid suspended Owens, probably his best player, for the rest of the season. The Eagles finished with a 6-10 record. But Childress says it was the right thing to do. "You know what I learned is, first of all, Terrell is a tremendously talented young man. ... But, I learned that it's about the team, the team, the team, the team. And we learned that painfully," he said. Childress says he's a product of Midwestern values. He was born in Aurora, Illinois, in 1956. He is married and he and his wife have four children. Childress started his coaching career at the University of Illinois in 1978. He coached under Barry Alvarez at the University of Wisconsin for several years. Childress joined the Philadelphia Eagles in 1999 and became the offensive coordinator in 2002. The Eagles have had several successful seasons with Childress on the coaching staff. The team won four consecutive NFC East titles and appeared in the Super Bowl last year, but lost to the New England Patriots. Some Vikings players, like tight end Jermaine Wiggins, say they're looking forward to working with a coach with that kind of experience. "He had some success when he was at Wisconsin. I think they averaged like 450 yards of total offense. Obviously, Philadelphia, he had success there. That's about as much of him I know," said Wiggins. "Obviously, I want to get a chance to know him. The main thing for me is to get the playbook and get ready to roll." Childress says he's ready to roll as well. He says he wants to start meeting his players and other team staff. Childress will also have to hire a coaching staff, and is expected to have input on the hiring of a general manager. When asked about his chances of going to the Super Bowl next season, Childress replied that he first has to wait and see which players are coming back. Zygi Wilf will next need to hire a general manager. The new GM will have to deal with more than a dozen unrestricted free agents who could potentially leave the team, including running back Michael Bennett, cornerback Brian Williams and pro bowler Koren Robinson. Team officials have until March 3 to evaluate free agents. After that date, those players are free to sign with other teams.